The Serpent Sub by Wotofo is the first Sub-Ohm Tank platform based off of the Serpent RTA design, hyper focused on flavor production that features a large 3.5ml tank capacity with cross compatibility with the widely available and proven Kanger SSOCC coil family. The Serpent Sub measures 22mm while managing to pack in a great reservoir capacity of 3.5ml, filled via a threaded top fill system. 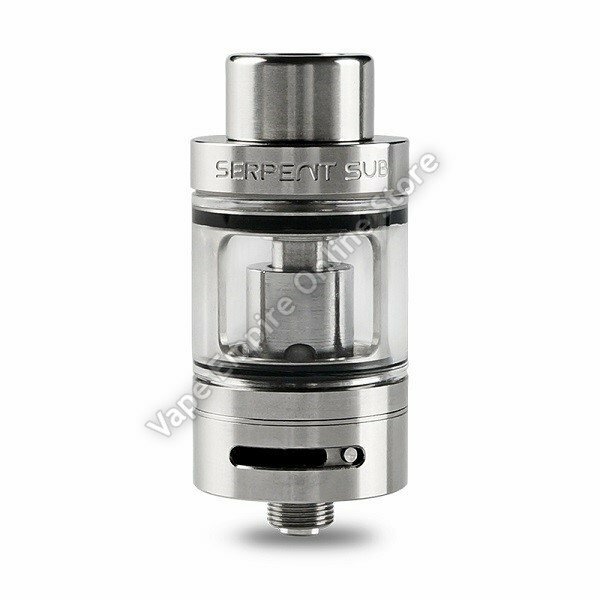 The chassis measures only 35mm from base to top tank section, making this one of the best size to capacity ratio Sub-Ohm Tanks available today. Inside, the Serpent Sub utilizes the Serpent Sub Coil System, which features a vertical coil arrangement with organic cotton wicking and is rated for up to 40W of output. The Serpent Sub is also compatible with the widely available and benchmark SSOCC Coil family from Kanger, greatly expanding the versatility and range. Airflow enters the coil system through two adjustable 10mm by 2mm airslots located at the base and can be fully closed for transportation or storage. Wotofo's Serpent Sub Sub-Ohm Tank is an extremely well balanced midwattage atomizer perfectly suited as an everyday use Sub-Ohm Tank.